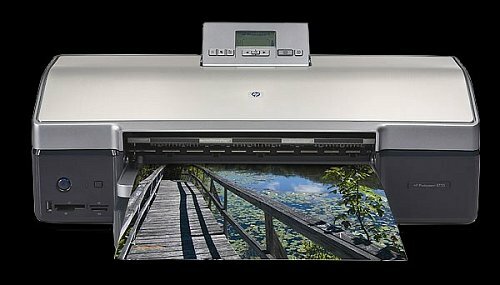 Bridging the gap between its professional and consumer lines of photo printers, HP has entered into the advanced amateur market with the HP Photosmart 8750 Professional Photo Printer. With the new HP 101 Blue Photo Inkjet Print Cartridge, this printer enables nine-ink color prints that deliver noticeable improvements in images with intense blues, including landscapes, seascapes and sports photos. The Photosmart 8750 offers color management controls and remarkable printer flexibility to produce realistic color and true black-and-white photos with neutral grays. It is expected to be available in April 2005 for an estimated U.S. street price of $499. The Photosmart 8750 is designed for photo enthusiasts who want a professional grade printer for producing high quality, long lasting digital photo prints up to 13 x 19-inches in size. HP Photosmart printers using HP Vivera Inks and HP Premium and Premium Plus Photo Papers offer the optimal combination of image quality and fade resistance, providing more than 100 years lightfastness under glass and more than 200 years in archive. 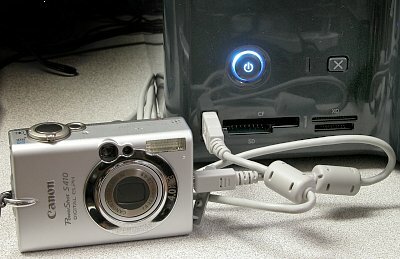 The Photosmart 8750 can be connected to a PC (Windows 98, Me, 2000, XP) or Mac (OS 9+, OS X) computer's USB 2.0 port with the supplied HP Image Zone software or any popular photo editing or viewing software. You can print photos directly from most digital camera flash memory cards or Microdrives using the printer's four, onboard memory card slots. You can print directly from any PictBridge-enabled camera - using the camera's USB download cable and the front-mounted USB port. The Photosmart 8750 is network-ready out of the box and can be connected directly to any Ethernet LAN switch, hub or router and shared with other users. With the optional HP bt300 Bluetooth Printing Adapter you can print wirelessly from Bluetooth-enabled camera phones, PDAs, laptops or other Bluetooth-equipped devices. Optional HP bt300 Bluetooth Wireless Print Adapter for wireless printing from camera phones, laptops, PDAs, etc. Optional black ink cartridge for faster, crisper black text for regular printing tasks. The Photosmart 8750 uses three different ink cartridges featuring HP Vivera inks - the HP97 (or the HP95) Tri-color, the HP101 Photo Inkjet and the HP102 Gray Photo Inkjet. If you're going to use the printer for ordinary text printing, the HP102 cartridge can be swapped out an optional black-only cartridge. Inside the top of the printer is a special place to hold the extra cartridge when it's not in use. 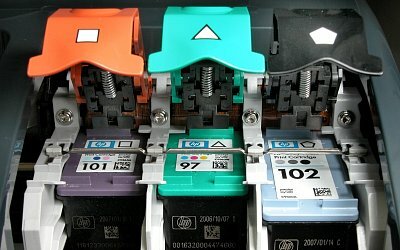 HP inkjet cartridges contain both the ink and printhead so each time you change out a cartridge you are also getting a new printhead. The HP Vivera inks are specially formulated to produce brilliant "true to life" colors and provide exceptional fade resistance when printed on HP Premium Plus Photo papers. Unlike most inkjet printers you'll find an Ethernet network jack on the back of the Photosmart 8750 printer. Simply plug it into your network switch or router and it's accessible by any of your PCs on the local network. Network users also have access to the memory card slots and can share photo collections via HP Instant Share software. 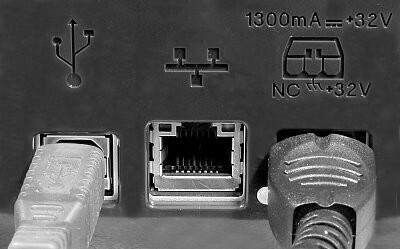 Connection to non-networked computers is via a USB 2.0 port. There's also a front USB 1.1 port for connecting an optional HP bt300 Bluetooth Wireless Printing Adapter or for direct printing from any PictBridge-compatible camera (see farther down this page for more info about PictBridge.) Printer power is supplied by an external power adapter (brick) with a detachable AC power cord. 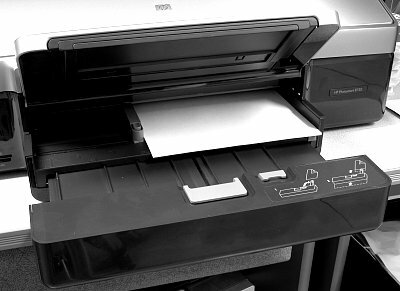 The HP8750 can be connected to most any PC or Mac computer via its USB 2.0 connection and used like as a dedicated printer, see the next two pages for a rundown of the Windows driver's options. And as just mentioned, it can be connected to a LAN or accessed wirelessly by an optional Bluetooth adapter. There are four flash memory card slots on the front for CompactFlash Type I or II cards including IBM Microdrives, Secure Digital and MultiMediaCard, xD-Picture cards and Memory Stick (and Memory Stick Duo, Magic Gate and Memory Stick Pro) cards. Only one card can be inserted at a time, you will receive a warning if you attempt to insert more than one card. The control panel has a large, flip-up LCD display, but it's a monochrome information display and cannot be used for image preview. Unless you intend to Print ALL then you need to make a thumbnail index sheet so you can select the desired individual image(s) by their assigned numbers. Many digital cameras made after late 2003 now feature PictBridge direct-USB printing. You connect the camera to the printer's front USB port using the regular download cable and select the photos on the camera's LCD screen with its special PictBridge print menu. 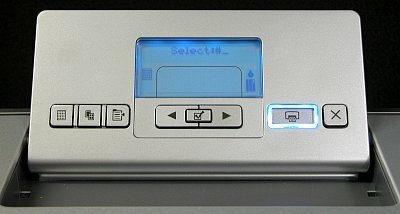 The memory card slots can also be used like a high-speed card reader when the printer is connected to a computer's USB 2.0 port. The memory card appears as a removable drive in the "My Computer" folder of a Windows XP machine. You can easily copy, move or delete files on "Drive K:" using Windows Explorer or any file management program. You'll find two new tray icons on your task bar. One looks like a memory card and turns green when a card is inserted in one of the four card slots. Right-clicking on it brings up the menu as shown above. The icon to the right gives you access to the 8750's printer driver. See the section "Print from Computer" on the next page for the driver features and options. With Windows XP or Me you will get one of these "popups" on your computer screen (if the printer is connected via USB) whenever a card is inserted. You can select an automatic action such as unload pictures using HP Image Unload Software or Open folder to view or copy the image files. The main paper tray is underneath the paper output tray. It can handle multiple sheets of any size paper from 4x6" to 13x19" - the paper does have to make a 180° bend inside the printer. For heavier stock use the rear paper path for straight-through printing of media up to 11.5 mil thick. And there is yet another paper input path on the output tray itself.